The weather has finally turned in our favor here in New Jersey. A morning temperature in the mid-50’s gave way to a wonderful 70 degree noon. I went on a club ride today. 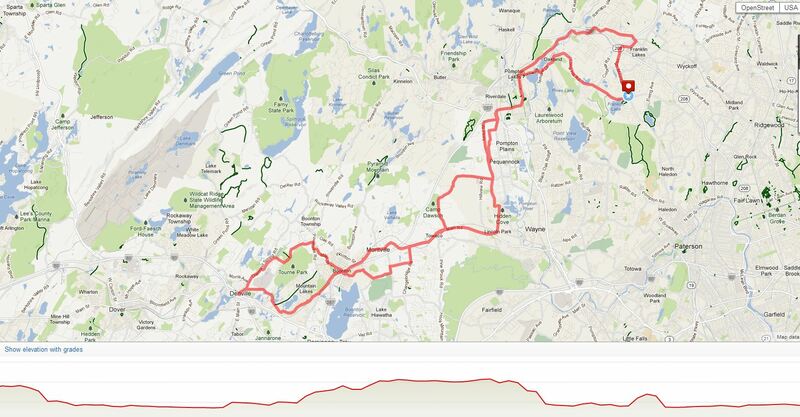 52 miles through the rolling hills of Bergen, Passaic and Morris Counties. Franklin Lakes to Denville and back again. By the time we had reached the midway point in Denville I needed to shed my cycling jacket and get down to just the jersey. It was fun to realize than I could roll up the jacket and ties the sleeves around my waist. I can’t say that I rode great. I rode well for the most part but I am still struggling with hills. I need to build my leg strength. Practice. The only way to do it. The feeling of the sun on my face and the warm air over me as I rode was nearly intoxicating. A great group of about thirty riders did the ride and it was truly a fun group. Chatter as we rode, jokes, singing. It was fun. Though I am a little disappointed with my struggled on the hills I take great satisfaction at not having to walk any up any. I rode them all, slow yes, but I rode them. My weight had spiked recently. Not sure why. My calorie counts tell me I was on target but the weight still jumped to 207+ lbs. Scary. I redoubled my efforts. Watched the salt intake. Reduced the calories. Increased the veggies, decreased the carbohydrates. I am back around 201 lbs. I am sure as I sit here right now, just a few hours after dinner and after our snack of fresh pineapple, that I am probably around 205 lbs but this will drop overnight. The important thing is that I recognized the bad trend and made corrections to reverse the trend immediately. I didn’t wait. I acted. Today I am at about a 2500 calories deficit. This is good. Ride 50+ miles and you will burn some serious calories. One year ago today I weighed 250.6 lbs. Today I am 201.2 Lbs. WOW. Even at that I had lost over 50 pounds. I was riding. I was eating better. The weight was coming down very quickly. I was exactly four months in to my Journey. I had lost 55 lbs… I still had so far to go. Looking back now I can see just how fast, dramatic even, the weight loss was. 55 pounds in exactly 4 months. YIKES. The rest of the weight would come, has come off. I was riding my bike then too. I may have ridden that day. I don’t remember. I know I was depressed that I was unable to get signed up for the 5-boro bike tour. I am doing it this year, one week from tomorrow. I had ridden a 22 mile ride with my friend KG a few weeks earlier. I was getting there. 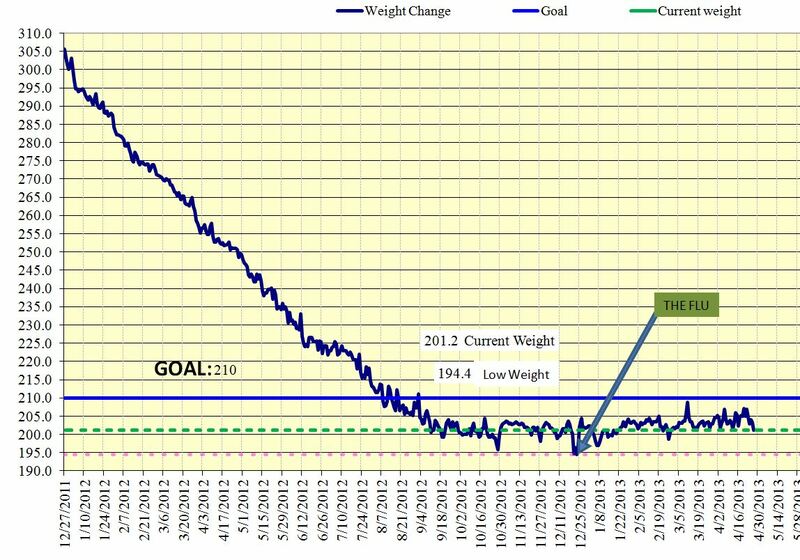 And to think I had only started the Journey four months earlier. This is the longest ride I have done since I tore up my knee last June. The knees were fine. I now just have to build up the legs. Next weekend I will do the 40+ mile tour in NYC. I did the ride in 2010. I am much stronger now. Much lighter now. 16 months now in to my Journey. I am upset that I struggle so with the hills. I am bothered that I am still working on building up my legs. Then I realize that it was one year ago that I still had 50 pounds to go to reach 200. It was only 16 months ago that I looked at the fat man in the mirror and said “you have to go now”. I like who I see in the mirror now. Categories: bicycling, Cycling, Emotional Well-being, Fear, fitness, Friendship, Fruits and Vegetables, Knee Injury, Proper Nutrition, Vegetarian, weight loss | Tags: Cycling, exercise, fitness, food, Friendship, health, healthy-living, humor, Hunger, Vegetarian, Walking, weight loss | Permalink. The weather makes such a difference in our moods. The ‘black dog’ in my family disappeared today and we had a wonderful day together, walking, cycling and enjoying each other’s company. Congratulations on completing 52 miles. Amazing!